Want to be notified of new releases in pskowronek/epaper-clock-and-more? Pull request Compare This branch is 82 commits ahead of prehensile:master. 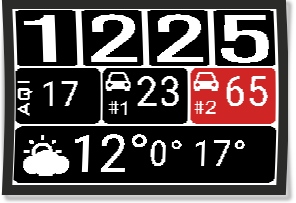 For both new gauges one may configure warning levels - in such a case the particular gauge becomes red (on supported devices, i.e. 2.7inch BWR). More photos of the assembled e-paper 2.7inch display sitting on top of Raspberry Pi zero enclosed in a custom-built LEGO™ housing and running this project are here. Since the original project supported 4.2inch B&W displays only, the code has been modified to support also 2.7inch B+W+R displays. This has been done by adding a second red canvas and down-sizing the black and red canvases to smaller resolutions as required by 2.7inch displays. E-paper 2.7inch by Waveshare does not support partial refresh and every modification of displayed data requires full refresh which takes around 5s meantime flickering a lot. The idea of modifying the LUT tables has been described here for 4.2" displays. Since I don't have 4.2" display I didn't try to provide similar feature for it. Since this project is a fork, the original licenses still apply. The modifications and enhancements are being done under Apache 2 license.